I look forward to this month every year! Although endo affects 1 in 10 women, it hardly receives any funding or attention so if there is a way I can help change that, I’m in! I will spending part of tonight putting together ribbons to pass out throughout the month at work as well as sporting yellow tomorrow for Yellow Shirt Day! Tomorrow a post & link up will go up for the month of March! Please plan to share your story and/or favorite articles regarding endometriosis! The link up will go up tomorrow morning and will stay active the entire month! Plus it will include a GIVEAWAY for a $25 SpaWish giftcard! We endo warriors need some pampering! 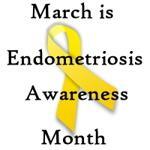 Looking for ideas for getting involved in Endometriosis Awareness Month? Click here! 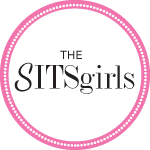 Next postSisterhood of Shrinking Jeans: Spring in 2 Action Kick-Off! If I have a yellow shirt, I’ll definitely wear it tomorrow! Although, I would be interested in a ribbon.